Seasonal Grass Cutting and Trimming usually begins May 1st and runs to September 30th. Using professional commercial grade equipment, Yardscape can provide spring and summer yard care packages to suit every budget. Contact us today to learn more! Book Yardscape’s Premium Service Option before April 1st and receive a free Over-Seeding with your 1st Fertilizer Application. All prices are for standard size residential 50’x100’ lot size. Contact to request a quote on oversized lots. Yardscape performs most types of irrigation repair (replace heads, fix leaks, reset or replace controllers or timers) throughout the season at competitive prices. Over time, lawns can begin to deteriorate for many reasons. Insect damage, weed infestation, drought and traffic can all cause lawns to suffer. 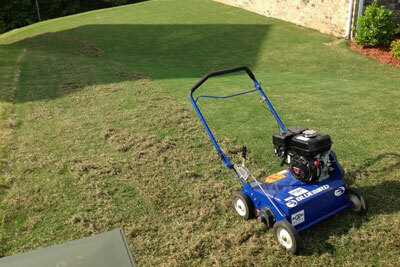 Many homeowners believe the only solution is to replace the existing turf with new sod. The effort and cost associated with lawn replacement is in many cases, prohibitive, but fortunately there is another alternative. With a few basic lawn restoration techniques, use of fertilizer, grass seed and proper watering a lawn can be restored to its original condition. A beautiful lawn adds to curb appeal and increases property value. Over-seeding is a process where grass seed is applied over existing grass in order to fill in bare patches and create a thicker lush lawn. This can be done using a broadcast spreader or a machine called a slit seeder (picture above). The slit seeder makes small slices into the turf and deposits grass seeds into the slits thereby improving seed to soil contact which is essential for seed germination. A thick healthy lawn will choke out weeds and minimize the need for herbicide treatments. Lawn Over-seeding – Prices vary depending on size of the property and area to be seeded. Please contact us for a quote. 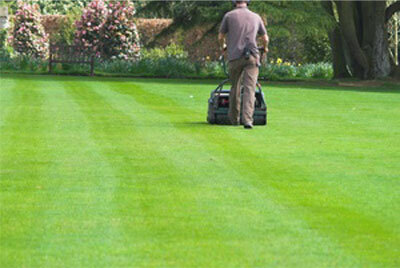 Lawn aeration involves the removal of small soil plugs or cores from the lawn. This is done mechanically with a specific machine which is equipped with hollow tines mounted on a disk or drum. 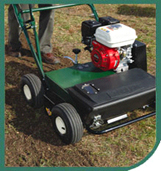 Known as a core aerator, it extracts 1/2 to 3/4 inch diameter cores of soil and deposits them on your lawn. Aeration holes are typically 1-3 inches deep and 2-6 inches apart. Core aeration is a recommended lawn care practice on compacted, heavily used turf and to control thatch buildup.